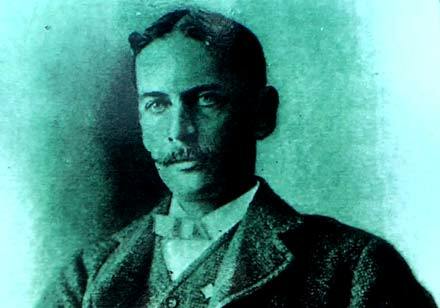 William Stanley (1858-1916) was an inventor and engineer. He developed the first practical transformer (which spurred the development of AC power) as well as other developments; like an improved electric meter and the first metal thermos bottle (vacuum flask). He lived most of his life and ran his businesses in Western Massachusetts during the golden age of electric development. Stanley is one of the most important inventors of AC power, his work puts him on a par with Edison, Westinghouse, Tesla, Elihu Thomson, Charles Brush and other major personalities of the time. Like the other great pioneers of the time he loved to tinker and design, held a disdain for legal quagmires of patent proceedings, and had his own set of friends and rivals in the industry. Born in Brooklyn, New York, William Stanley attended private schools before enrolling at Yale University. He began to study law at age 21 but less than a semester later left school to look for a job in the emerging field of electricity. The decision marked the beginning of a productive career whose highlights included the invention of the modern type of transformer, and the creation of the business enterprise that was to become General Electric's Pittsfield Works. Stanley's first job was as an electrician with one of the early manufacturers of telegraph keys and fire alarms. He then worked in a metal-plating establishment before joining Hiram Maxim, inventor of the machine gun and already a pioneer in the electrical industry. As Maxim's assistant, Stanley directed one of the country's first electrical installations, in a store on New York's Fifth Avenue. 1883 - Stanley was inspired by Charles F. Brush's work on batteries which involved study of electromotive force. Stanley developed AC power circuit designs in his notebooks but didn't yet have a chance to build prototypes. This laid the foundation for his understanding of electromagnetics - the basis of AC circuits and apparatus. "I foresaw at that time, dimly, to be sure, but still with suffient accuracy to realisze soemthing of its value, that alternating currents could be used to produce and electromotive force upon the circuit to be regulated, in place of the battery electromotive forces suggested by Brush and the resistance electromotive forces of Weston and Thomson. I do not mean to imitate that at that time I had complete knowledge of the invention - that came later - but that it was the starting point from which I worked until, in 1885, the completed system was developed." Stanley said that in the period prior to industry successes in 1885 it took "definite self-conviction" to keep working on AC power which was experiencing many setbacks in experiements. There were no useful books on the technology and he refers to AC power as a "despised and rejected line of work". 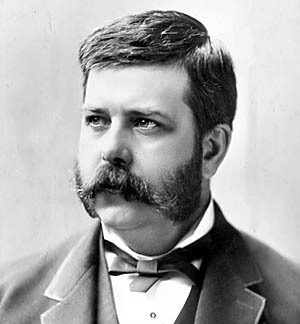 1884 - Stanley moves to Pittsburgh to work with Westinghouse. He worked on solving problems in AC distribution but had no alternator to work with. He "wasted" a great deal of time trying to convert DC to AC power for experiments. 1885 - Inventor and industrialist George Westinghouse learned of Stanley's accomplishments and promoted him as chief engineer at his Pittsburgh facility. 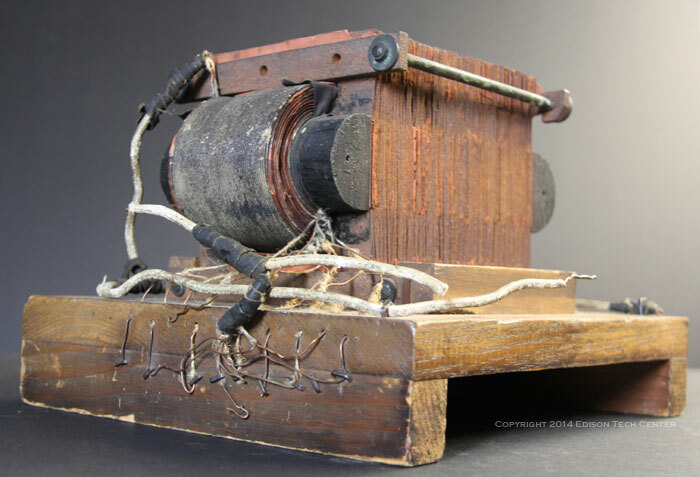 It was during this time that an AC transformer was developed by Frenchman Lucien Gaulard and Englishman John Gibbs. In the spring Stanley goes to George Westinghouse and asks him to order a Siemens generator and Gaulard and Gibbs transformers from Europe. Stanley believes that the Gaulard and Gibbs Transformer is not commercially useful. He believed he could solve the problems in the existing system by having the transformer have each coil operate independently of the others in circuit and have it be self-regulating, both in electromotive force, and in terms of current transformed. Westinghouse instructed Stanley and his assistants, Albert Schmid and Oliver B. Shallenberger, to make tests to determine the commercial value of the Gaulard and Gibbs system. He also arranged to have a number of the transformers and a Siemens alternating-current generator forwarded from England to Pittsburgh. 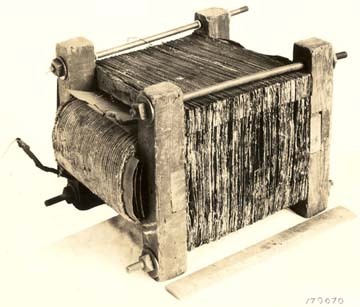 Stanley, working under the direction of Westinghouse, devised a further improvement, which consisted in securing the enclosure of the coils by making the core of E-shaped plates, the central projections of each successive plate being alternately inserted through rewound coils from opposite sides, thus permitting separate winding and consequently the better insulation of the coils. This form was further improved by Albert Schmid, who extended the ends of the arms of the E to meet the central projection. When inserting these plates the extensions were temporarily bent upward, and upon being released each plate formed a closed magnetic circuit about the sides of the coils. Schmid was a Swiss mechanical engineer working for Westinghouse who had worked on some of the earliest dynamos and arc lamp systems in Europe. 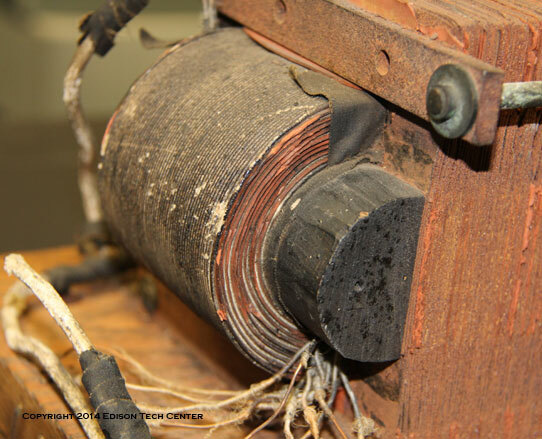 Above and below: Stanley's 1885 prototype transformer at the Berkshire Museum. William Stanley, Albert Schmid is equipped with knowledge of the European advancements and then develops the first reliable transformer - it uses a soft iron core and adjustable gaps to regulate the amount of Electromagnetic Field in the secondary winding. Stanley quickly became unhappy with the Siemens generator which he was provided with Starting on November 5th, 1885 he developed his own radial pole type alternator and sent the drawings to Pittsburgh. In 1885, ill health almost cut short his career - some say he worked himself too hard. Stanley had been working in Pittsburgh which was Andrew Carnegie's steel town and had the worst air quality in the US, it was also known as "Sooty City", and this contributed to William Stanley's poor health. The move away proved a disguised blessing, because it necessitated a move to his family home, Great Barrington, Massachusetts. In those peaceful surroundings, he was able to develop some ideas he had suggested two years earlier to his employer, George Westinghouse (who helped finance Stanley's lab) for a new type of transformer. One of 19 transformers used in the Great Barrington installation. 1886. The first full successful AC distribution system in the world! 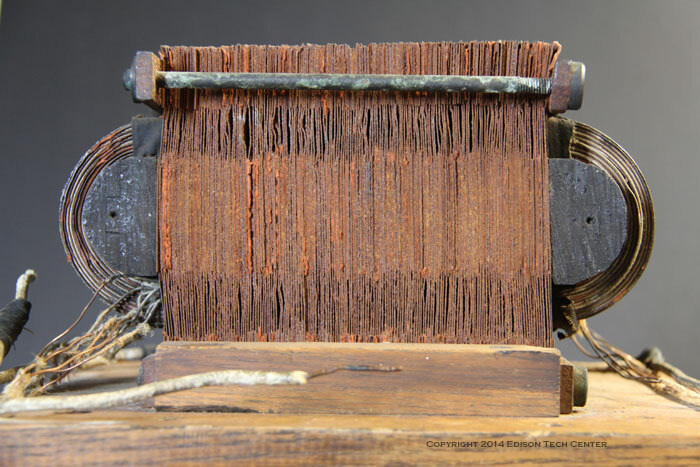 Stanley received a patent on his transformer: "Induction-Coil," Patent No. 349,611. William Stanley explains to Franklin L. Pope (adviser to Westinghouse and patent lawyer.) that is design was salable and a great improvement. Pope disagrees but Westinghouse decides to trust Stanley anyway. 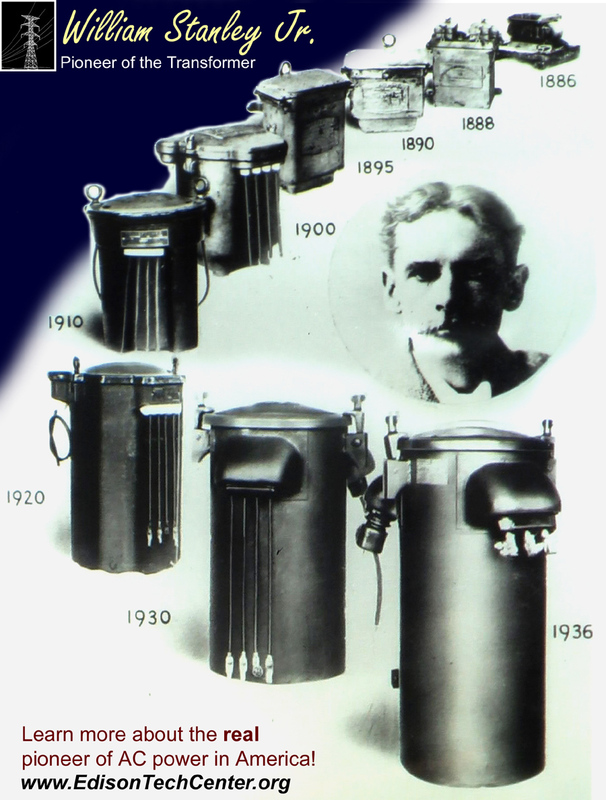 These various inventions and discoveries led up within a year to commercial production of transformers of high efficiency and excellent regulating qualities. The development was a fine engineering performance in speed and in quality. The most important single contribution was by Stanley. He brought out the parallel connection in which the transformers are connected in parallel, across the constant-potential alternating-current system, instead of being arranged in series, as in the Gaulard and Gibbs connection. He obtained patents on the method, involving the construction of transformers in which the counter electromotive force generated in the primary coil of the transformer was practically equal to the electromotive force of the supply circuit. This is obvious now, but in 1886, when the principles and characteristics of the alternating current were practically unknown, it was a wonderful invention, and revolutionary in character. On this invention Stanley's fame largely rests. Of course Stanley did not discover or invent a theory of counter electromotive force before any one else had thought of it. Such fundamental things seldom happen in invention. His claim to great and original merit rests on the discovery of a theory which was new to him and the use of it in making a structure of immense importance in the affairs of men. Briefly, all transformers now made are built upon practically the same principles as those that were developed in these early products of the Westinghouse Company. In the 1880s and early 90s George Westinghouse had a team of some of the best engineers in the world: William Stanley, Louis Stillwell, Albert Schmid, Benjamin Lamme, Oliver Shallenberger and Nikola Tesla. 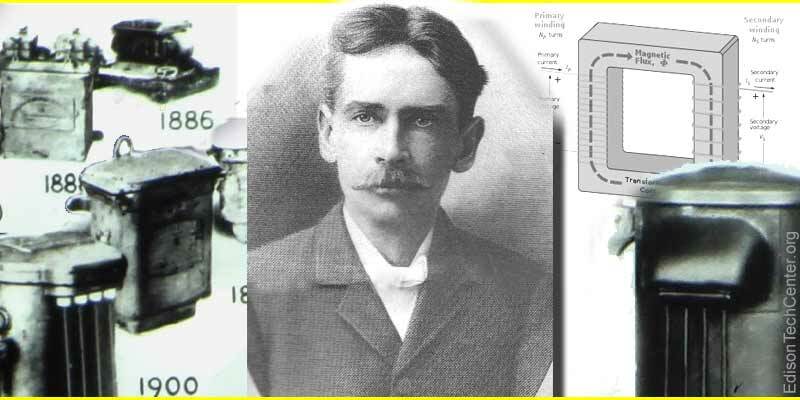 Meanwhile JP Morgan was gathering together the best engineers he could find in the AC field, people like Charles E.L. Brown who was one of the earliest proponents of polyphase AC power. Westinghouse had a clear advantage controlling much of the patents in the world's most lucrative market(North America). However, underneath this appearance of success was a pile of eccentric and oddball personalities. Shallenberger and Stillwell worked together well, but Stanley had differences with some, and Tesla had trouble working with any of them. Whether it was egos, corporate environment or simple anti-social behavior found in geniuses, the eventual result was inventors breaking off to do their own thing while they tried to make as much as possible off of royalties. George Westinghouse came up to see the working system at Great Barrington with his entourage and was pleased but with time things began to sour between William Stanley and Westinghouse. Eventually Stanley had a falling out with George over money. It was said that Westinghouse's lawyer Franklin Pope convinced Westinghouse to drop Stanley's business. Ironically Pope later was killed by one of Stanley's transformers while checking on it in his basement in Great Barrington. Stanley had ambitions of creating his own electric company on a scale to compete with Thomson-Houston, Edison, and Westinghouse. He was not deterred by a threat from someone at Westinghouse that if he left "We will ruin you!". He set up shop in nearby Pittsfield, MA. Stanley produced high quality large transformers with the help of Cummings C. Chesney and John Forrest Kelly to product the SKC line of transformers. After becoming disillusioned with the electrical business due to the drawn out patent fights he sold to the Roeblings Family. Stanley lost control of his company and it became part of General Electric. Chesney moved to Schenectady to continue his work while Kelly (who was a bit of a loner) preferred to work on his own. SKC transformers from Stanley's independent years continued to be in use over 100 years later in places like Middle Falls, NY. Stanley's genius continued to influence the industry as he produced newer and better power distribution systems for General Electric. The Stanley Works in Pittsfield, MA develops new power distribution systems at the birth of the power grid. Stanley's air blast transformers are used in the Folsom Powerhouse in 1895 and other GE AC power systems. Stanley's genius was employed in the making of distribution systems for AC power at Niagara Falls in a project which divided the job between Westinghouse and GE. Stanley grew tired of the long legal battles required to protect patents. As an engineer he found these proceedings draining and frustrating. He spent the later years of his life (1900-1916) experimenting with other technologies. He developed a better thermos among other things. At times he attended honor ceremonies and photo shoots at General Electric for his lifetime of achievement, but he had already disengaged from the major transformer works in Pittsfield in his final years. The legacy of Stanley's transformer works lived on in Pittsfield, MA until 1986 when GE closed the plant. At the time they had been producing some of the largest transformers in the world for clients around the planet. 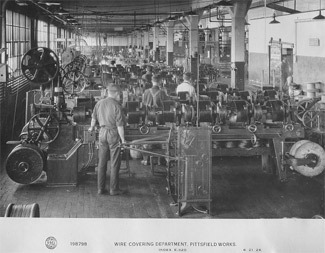 The works were profitable but were closed anyway as part of GE's restructuring. GE gave Westinghouse's transformer operation all 100 years of technology. Westinghouse's operation was in Indiana and some of the workers moved there, but that was shut down a year later. Today the only major transformer manufacturing operation still left in the US is Niagara Transformer Corporation. We recommend you visit the Berkshire Museum in Pittsfield, MA to learn more about Stanley. The Power Makers: Steam, Electricity, and the Men Who Invented Modern America by Maury Klein. 2009.